Disc brakes are more expensive than v-brakes, but in a heavy rain they will break down. V-Brakes are becoming harder to find, but they're much easier to maintain and don't break down as easily. What kind of brakes are best for mountain bike racing? Look at any high end bike and you will find hydraulic disc brakes. There will be people who argue the pros/cons of hydraulic vs mechanical disc brakes but it's hard to deny what the entire industry is putting on their most expensive rigs. For ease of stoppage, minimal brake fade and ease of modulation - the hydraulic disc brake wins hands down. You can hammer downhills w/ disc brakes all day long and your hands don't get tired... try that with old school cantis or v-brakes. Plus - disc brakes will maintain stopping power in wet vs a rim brake which will definitely be compromised in wet. There are plenty of advantages to disc brakes while mountain biking. In my opinion, disc brakes give much better feedback to the lever with almost no fiddling with them. Rim brakes can be set up to work as well, but it has been a long process every time I've tried it. Rim breaks also can cause problems by heating up the rim itself, and as a result the air in your tires. It may seem silly, but you can blow out a tube with enough heat. There is also a problem with "brake fade" as the pads heat up. 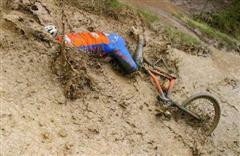 As for riding in the wet, I have never had a problem with my BB7's stopping my over-sized self in the wet. Even in rain puddles up to the bottom bracket. I have also never had to maintain the brakes during a ride. From my experience racing USAC Collegiate xc and short track, disc brakes are the way to go, and I prefer hydraulic to mechanical, as long as they're the right model. You can find a lot of reviews on the mtbr.com forum about disc brakes to find one that would work for you. 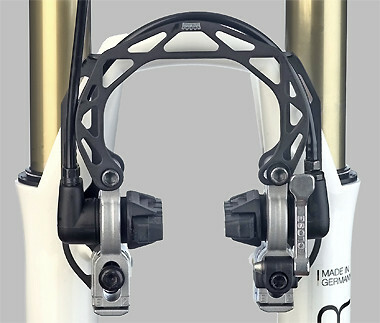 The Avid Elixir R SLs I use on my full-suspension mtb have never let me down and are easy to adjust. From general riding experience, disc brakes are much more responsive in dusty and wet situations than v-brakes are. Disc brakes provide another advantage during race situations: If you flat during a race, you just have to flip your bike over, open the quick-release and pull the wheel off. Since disc brakes don't go around the tire like rim brakes do, you don't have to disengage or reengage the brakes when you pull the wheel off or put it back on. Also if you're running rim brakes and you hit a rock during a race that makes your wheel go out of true, your rim will be hitting the brake pads while you ride, which can end your hopes of placing. With disc brakes, your braking power is not affected by the trueness of the wheel. You'll probably want to true the wheel when you get back to your tent, but your race isn't over if you're running discs. My MTB region (Belgium / Holland) has a lot of mud. 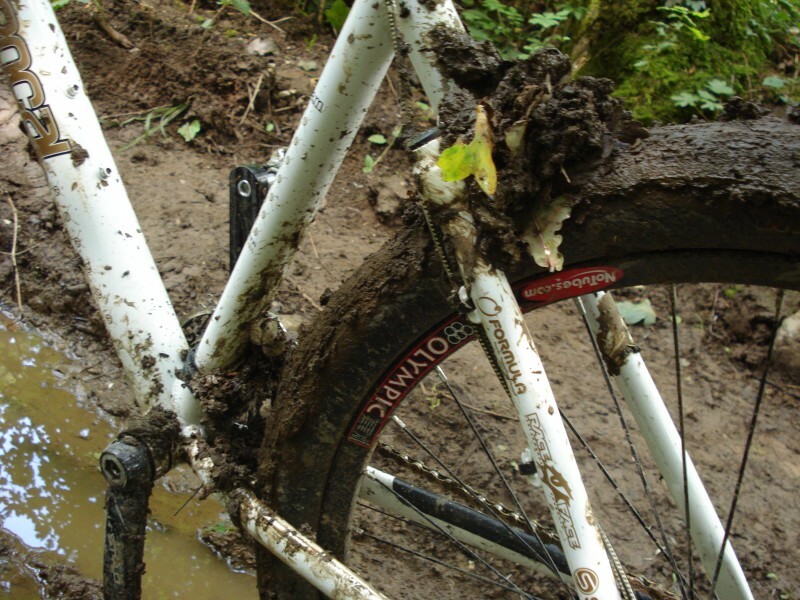 Disc brakes seem less capable of handling these wet and muddy conditions. They simply cannot handle mud, and start making noise. I have also seen front wheel: disc brake (does not get as much mud), rear wheel: Magura. For cross country - hydraulic disk brakes with small rotors. For downhill - hydraulic disk brakes with big rotors. Not the answer you're looking for? Browse other questions tagged mountain-bike racing disc-brake hydraulic-disc-brake or ask your own question. Buying brake levers, how do I find the correct ones for my bike? What do I have to know, to replace my hydraulic disc brakes with new ones? Are there any adjustments for hydraulic brakes? Is it OK if my brake pads are not “just” touching the rotor in my cable disc brake bike?